It is so ridiculous to find out this type of news is happening in a developed and rich country like China. The Chinese locals are prohibited from keeping their big breed dogs in Beijing because the authorities believed that the selected 41 big breed of dogs carry health threat to the residents. The Chinese authorities are finding the easy way to put the blame against these big canines when the dog owners must be educated to take their dogs to vets for regular health checkup and rabies vaccination. 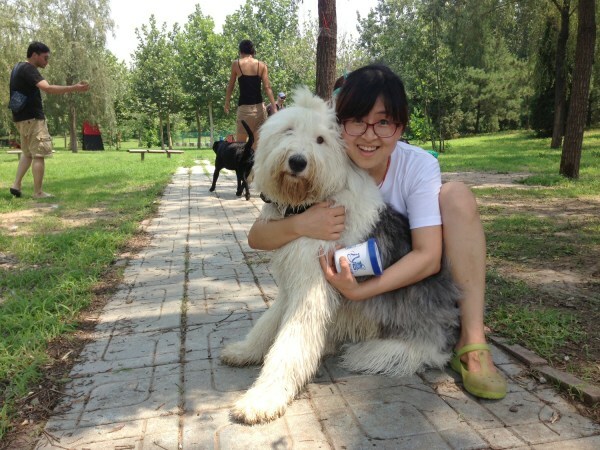 Yao Wang with her English sheepdog named "Guoguo" (which means "fruity") in a park on the outskirts of Beijing recently. BEIJING – A local law has put some Beijing residents on the run, as they fight to keep their best friends alive and well. Yao Wang is a 26-year-old Beijing native who has been hiding from the government since May. She’s moved four times in the last three months to stay ahead of the law. Wang is not moving to protect herself. She is afraid that without her help, the Beijing police will take her dog into custody and execute it. Guoguo, which means "fruity" in Chinese, is her friendly English sheepdog. A local law bans 41 dog breeds from city limits for being “big and vicious.” The law also limits how tall a dog can be -- 14 inches is the maximum height. The provision has been on the books since 1994, but only began to be strictly enforced this year. The new enforcement has shocked many Beijing residents. “This is nonsense. How can they decide whether a dog is vicious?” she asked, as her white, furry friend, whom she refers to as her daughter, joyfully ran around the park with her companions. Wang was not sure what kind of threat a sheepdog posed to the public. As it turns out, authorities are not so sure either. The director of the Chaoyang District Office of Dog Management, who was only willing to provide his family name, Liu, responded to NBC News' request to clarify the rationale behind the law. “We don’t know either. We are here to carry out the job,” Liu said. Mary Peng, co-founder of the International Center for Veterinary Services in Beijing, had one possible explanation. She said that in 2012, 13 people in Beijing died from rabies, more than doubling the previous year's figure. 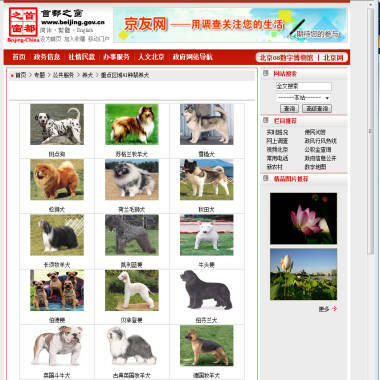 The Beijing Municipal Government's website shows the 41 breeds of dogs that are banned from the city limits for being "big and vicious." There are more than 1 million dogs in Beijing, but as Peng explained, it’s not common for them to receive rabies vaccines. “In China, only 10-20 percent of dogs have been vaccinated [for rabies], compared to more than 70 percent in the U.S.,” Peng said. But that explanation does not sit well with Wang, who now commutes an hour and a half to work every day to keep Guoguo away from the long arm of the Beijing law. Before the government started to enforce the law in May, it only took Wang half an hour to get to work. “Guoguo had four vaccinations since we took her home last September, when she was three months old,” Wang said. Peng also pointed out that safety issues may have little to do with a dog’s size – a big golden retriever is far less likely to bite people than a small dachshund or chihuahua. Guoguo, however, remains a dog on the run, at risk of being taken into custody and costing Wang an $800 fine if she is found to be living within city limits. The problem is a new one in China. Pets are still a relatively new phenomenon, only catching on recently as people have more disposable income -- and only one child to spend it on. In many cities, eating dog remains quite common. Last month, despite protests from animal activists, Yulin, a small town in China’s southern Guangxi province, held an annual dog meat festival. The festival is part of summer solstice celebrations. Locals believe eating dog meat on that day will keep evil spirits and diseases at bay. State media reported that an estimated 10,000 dogs were killed during the one-day event. 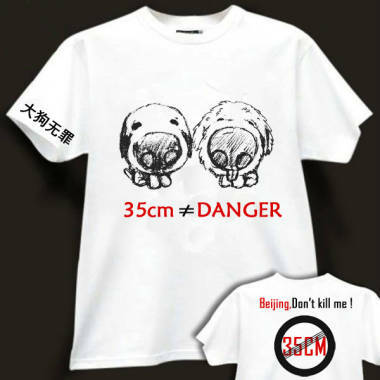 Yao Wang designed a T-shirt to protest the ban on big dogs - 35 cm (14 inches) refers to the height restrictions on dogs in Beijing. Traditionally, dogs have been used as guards for the wealthy in China -- perhaps one reason why the government and some Chinese people perceive them as dangerous. But to dog owners like Wang, dogs are not only pets but also family members. Due to the one-child policy and aging population, this new attitude toward dogs is becoming more common. To many, the regulations on dog ownership are just another reminder of how intrusive the Chinese government still is in people’s everyday lives, even as it has slowly retreated over the last three decades. Dog lovers will continue living their lives one step ahead of the law, moving from house to house on the outskirts of Beijing and walking their pets at absurd times. 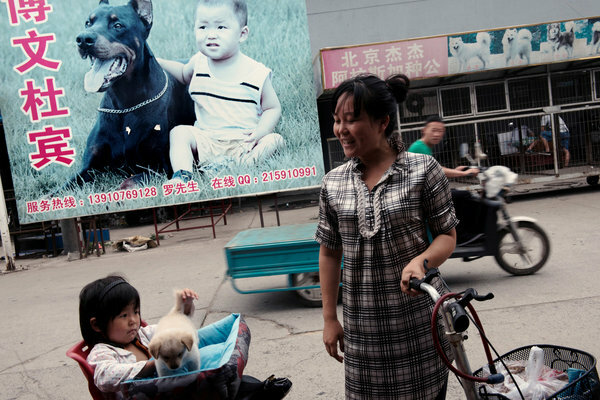 Wang walks Guoguo at midnight and 4:30 a.m.
A mother bought a puppy for her daughter at a legal dog market in Beijing. Large dog breeds, including collies, Dalmatians and Labradors, have long been banned from the city, and recently the government has stepped up a campaign to track down and remove the offending pets. A black-market dog sale in Beijing. The dogs are among those the Beijing government has long banned from much of the city because of their size.